I hate clam chowder that has more of anything else but clam meat but unfortunately this is the way with most restaurants. 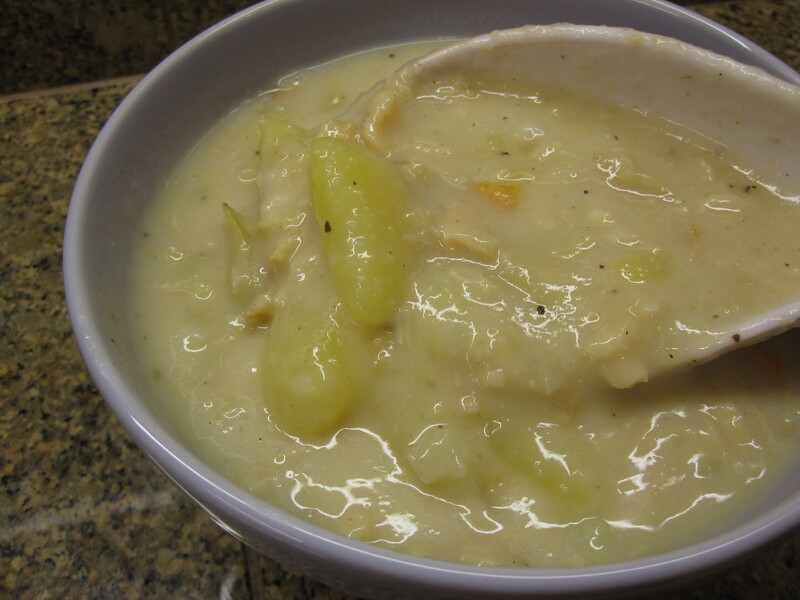 This is my version of clam chowder– LOTS of clam meat, some potatoes and some onion. NOTHING else– no carrots, celery, bell peppers, and who knows what’s that big chunk of gooey thing. Boil potatoes until just soft. Drain. Cool slightly and cut into strips. In a deep pot, add a little oil and saute onion until tender. Add in clam meat, clam juice and water. Cover and bring to a boil on high heat. turn down the heat to medium and let it simmer. Prepare roux: In a small sauce pan add butter and flour over medium low heat. Whisk constantly with a balloon whisk, until the roux is pale brown and fragrant. Take care not to burn the roux. Scoop out some liquid from the deep pot to the roux, use the whisk to mix well. The roux mixture will be thicken at first. Keep whisking in soup liquid to the roux mixture, until the roux mixture is thinner. Pour roux mixture back to the deep pot, whisk to combine. Add cooked potatoes, ground black pepper, and thickening agent. Stir over medium heat until it starts to bubble and thicken. Stir in whipping cream. Enjoy! Since there’s enough salt in the canned chopped clam meat and clam juice, I omit salt in the cooking. Cream of Wheat: Instead of using more butter and flour to make the roux to thicken up the soup, I use cream of wheat as it is much healthier and does a very good job thickening the soup.